Decorating your bedroom door has always been a favourite holiday pastime; we have this fab free template to make a door hanger and plaque. Put pencils in them, hang them from the ceiling or create fun under water games, these octopuses started life as a toilet roll. Download our free template to make your own. Planning some fun over the holidays? Keep it all written down in this fun to make journal. Just use a 5x7 card blank, fold your A5 paper in half and use string wrapped around the spine to hold it in place. Cover the outside of the spine with bright patterned paper to hold it all in place. Add a button on foam squares to the front then wrap twine around to keep it closed. Cut a piece of coloured felt to 5.5 x 10cm and using another colour cut another rectangle to 4.5x 8.5cm, layer on top of each other and scrunch it in the middle. Secure with a strip of felt. Decorate with gems or glitter glue. Add to clothes, hair or fashion accessories. Every girl needs a handbag to keep all her important bits and pieces in. Use our free template to make your own foam handbag, and then decorate to make it unique. Need some where to keep your favourite jewellery; we have created this fab foam jewellery box. It’s easy to make and build with our free template. 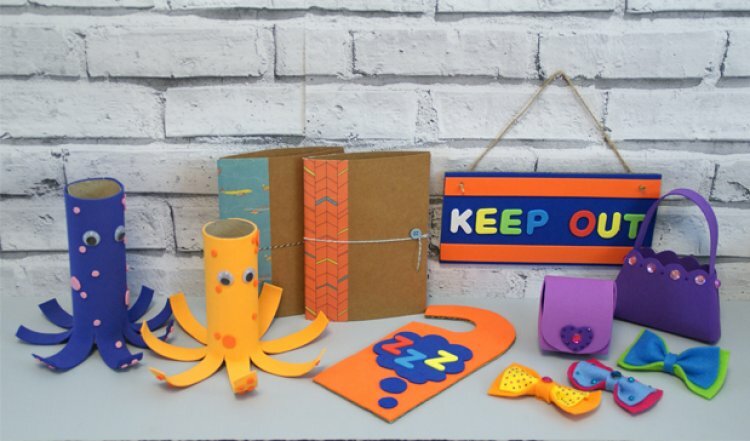 And there you go six great crafty projects to keep little fingers busy this summer. We love to see your crafty projects, show us what you make in our project gallery.